If you have ever eaten loose olives before, there is a good chance that it was imported from Greece in one of these barrels. 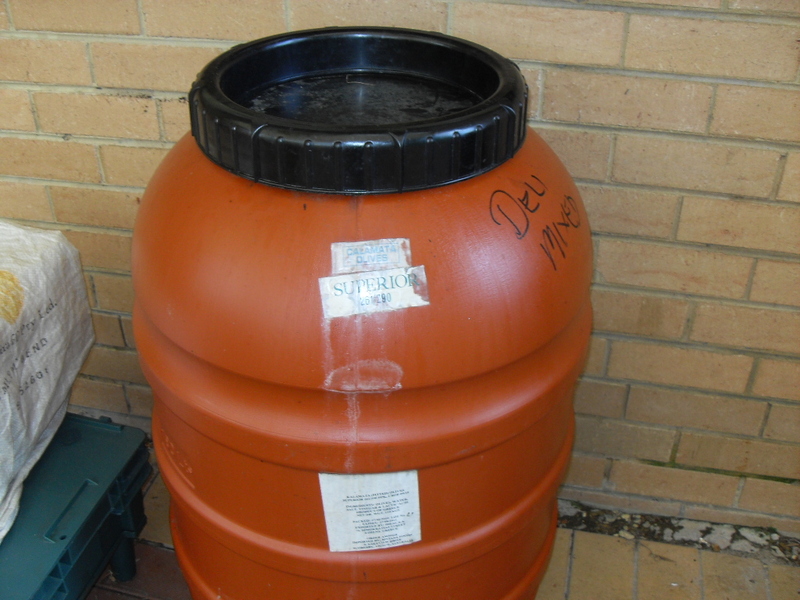 At approximately 200 litres, or 50 gallons, they are made from food grade plastic and have a sealed removable lid. They should also have a plastic grille inside which I presume was for pulling the olives up through the liquid, and this is handy for lifting out any loose leaves or twigs. And like how using coffee grounds in the garden leaves a lovely smell around the place, these barrels have a good coating of olive oil that seems to come through when full of water. The final benefit is perhaps the best one, these cost me $10 dollars each. It turns out that there are not too many things a business can do with an empty olive barrel, so they end up being shredded for cat litter or some other less than ideal ending. The water barrel on the right below is a commercial rain collector that I paid $100 for, and the one next to it is a used olive barrel. Same thing for a tenth of the cost. This was the sight after a good rain, all full and ready to store. I have a shed in the back where I collect the rainwater from, actually only one of the shed gutters is being used, so I could probably get another 10 or so of these and have more than enough for a long dry summer. So if you see one of these old olive barrels, make sure you find a way to get it home and hooked up to a source of rainwater. They can also be used as a rolling compost bin and worm farm, and there will be a future post all about that. How do you collect and store rainwater? Tags: Barrel, olive, Rainwater harvesting, Rainwater tank. Bookmark the permalink. eta found that picture of the double array I was looking for… it was in Alastair’s link on Deep Green Permaculture’s post, hence my confusion (and annoyance in not being able to find what was right under my nose when I knew it was there but couldn’t see it)! We began our ‘fit out’ tonight… so far so good and if you like I can post a link when we’re done. We got ours for $10 each. Will be interesting to see how much fittings cost but still it’s cheaper I think long term, or even short term for that matter, compared to the retail alternative. While I’m here, long shot, but when I came across your page I was lucky to find a couple of others which I also bookmarked. The one page I can’t find (to show someone else who asked) is one where a guy has barrels stacked down one side of his house, maybe about ten in a row, then another ten stacked on top and I ~think~ they’re blue barrels? He then talks about having to set up something fancy if he wants to add a pump? Anyway on the off-chance you’ve come across that pic/link and can share that would be great. Hi Kristy. I was going to recommend that you check out the rainwater tank on Deep Green Permiculture, but noticed you had already been writing to him with the same question! Please post a link when you are done with the project, and good on you for taking it all the way from an idea to a reality. here ’tis 🙂 http://seemyfootprints.blogspot.com/2011/09/950l-water-tanks-for-50-fittings.html Thanks for the encouragement, it’s always appreciated. We live in northern wisconsin, Can the barrels you’re talking about be found in this area? can these be found in northern wisconsin or northern minnesota? I’m sorry I can’t be too specific about your area although there is a very good chance that they are available. If you ask your local deli or supermarket (or any place that sells olives loose), they should be able to tell you what kinds of containers they buy their olives in. The larger the store the better because they are more likely to buy in bulk. If they tell you that they get 50 gallon barrels then it is almost certainly the same or similar to the olive barrels I’m using. I hope that is of some help and best of luck with it!! Have been using these barrels for collecting water for years but didn’t know anyone would be into it. Awsome to know there are others out there that want to make things different. Will be back to your site thank you, OK bye. Cheers Nicole. Thanks for those kind words and for stopping by. 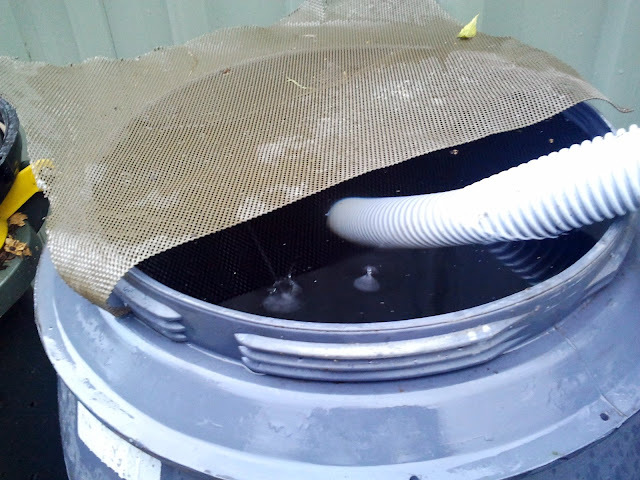 We loved our rain barrel, until we found out that in our state (WA) it is actually illegal to catch and store rain water, because it interferes with dam planning etc. – so make sure you check whether your State allows rain barrels, the fine (if you’re caught) for illegally maintaining barrels is rather hefty. I’m sorry to hear that Katie although I’d heard something recently about that law getting changed shortly. Thank you for the good advice and I can only reiterate to the fine readers here to check their local regulations regarding rain water collecting. Katie if you have a reference to the Act/legislation that covers this I’d be interested to read it. Off to see what Google has to say and maybe a Council site or two. Not sure how it interferes with dam planning when we’re on water restrictions but I’m sure I’ll find out! Hi Kristy, I think Katie is in Washington State, and not our WA – Australia. No such restrictions that I know of and please do let us know if you come across something of interest. Thanks for stopping by the site and leaving some comments – hope to see you back again soon! I’m adding your site to my reading list! Thanks for covering this very little covered topic. I have been using these rain barrels for years. much better value for money than water tanks. one issue is make sure you cover the top with some fly wire if it is going to be left open. Otherwise make sure you empty it every couple of weeks to avoid mossies. Shane I would be most interested in getting some more. Where did you get them for $10. What I am using them for now is putting them in my green house. The reason is that the sun will heat the black bin during the day. This heat will then be released during the night thus keeping the plants warm. I found this out from a guy on utube. I suggest everyone does searches for growyourowngreens.com. This guy makes some fantastic videos. Hi mate. I’ll give you a call over the weekend with the details as I would like to get a couple more for myself. Only issue is with transporting them, as they take up a heap of room in a normal car. Great idea with using them as a source of heat for the greenhouse, one day you are going to have to let me come around and check out the place! Those barrels are great, aren’t they? You got a good price – I pay $25 for mine! Still cheap, I reckon. 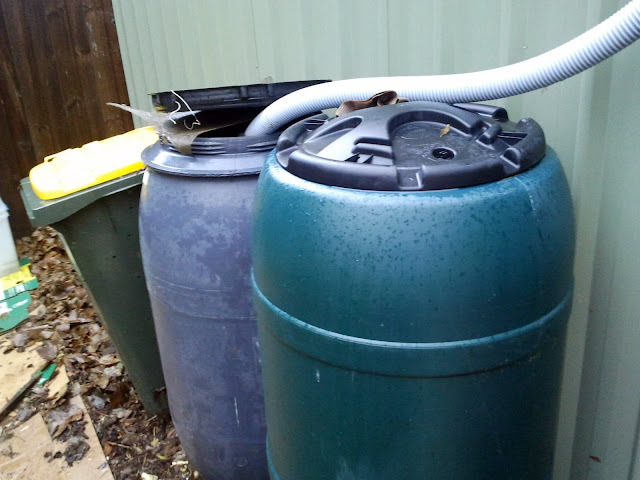 I’m also going to use some for rain barrels to collect off the roof of chook sheds etc – that way I have water right there for the chickens, rather than having to haul it in buckets. Great post Darren. 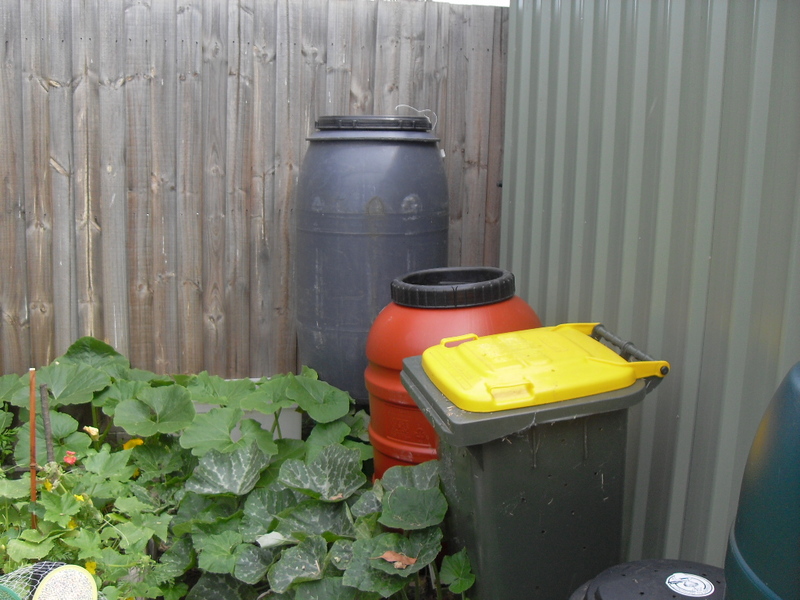 I’ve just started using one of the barrels for composting and so far so good. You are right about the price being a good one but really, anything up to $35 -40 is still good value compared to the retail alternative. A great thing about having a few of these olive barrels around is that you can collect rainwater off any down pipe from the roof, like you were saying. Thanks for stopping by mate. Do you know how long the water can be stored for in those containers? I’m guessing as long as in those commercial water barrels. I’ll let you know in a couple of months when I open up one of full ones! For watering the plants and not drinking – as long as they stay sealed (and they should have a rubber seal included on the lid), and they were designed to store food in liquid, then I’m guessing many months. Thank you for trying to make a difference. All those plastic containers are left on the side of the road or in abandoned blocks. I have a couple of the orange ones for my rainwater and they seem to do the job just fine. One thing to watch out for is that they can get some algae on the sides. Nothing that is a real problem unless you fit a tap to the bottom of the barrel and then it blocks up. Keep at it – great stuff!